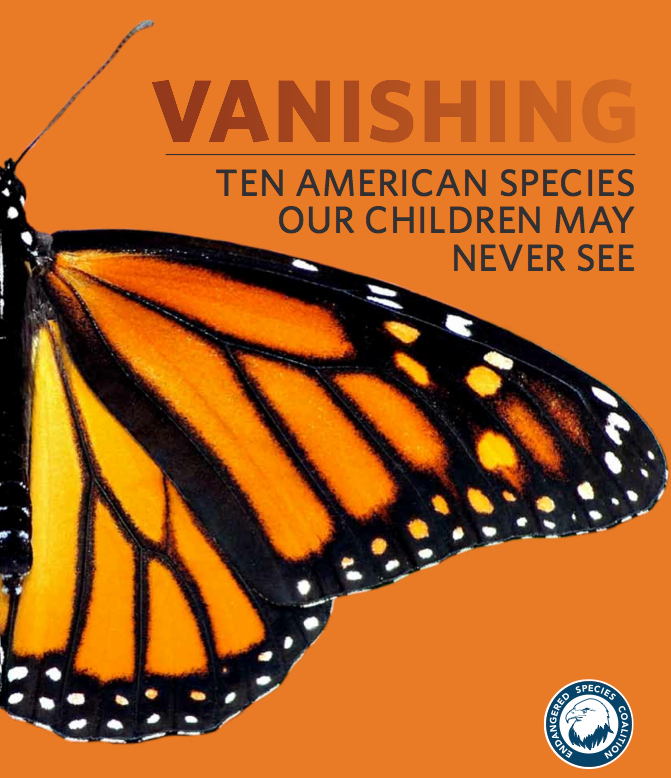 According to the report, up to a billion monarch butterflies used to color our skies each summer, yet only about 33 million remain – a decline of more than 90 percent. Additionally, the once-common little brown bat has been decimated by the fungal disease, White-nose syndrome, and is now virtually extinct in the Northeast United States. Finally, the rusty-patched bumblebee, an important pollinator, has disappeared across 87 percent of its range, and diseases are thought to be responsible. Coalition member groups nominated wildlife species in the report. A committee of distinguished scientists reviewed the nominations, and decided which species should be included in the report. “Scientists agree that climate change is a huge threat in many direct and indirect ways to species diversity and survival,” said Dr. Jan Randall, Professor Emeritus of Biology at San Francisco State University, and chair of the scientific advisory committee for the report. The ten species in the report are the mountain yellow-legged frog, monarch butterfly, North Pacific right whale, great white shark, little brown bat, whitebark pine, rusty patched bumblebee, greater sage-grouse, polar bear, and the Snake River sockeye salmon. “This report does a great service by calling attention to the fact that species are vanishing before our eyes, including species like the little brown bat, which are underappreciated and, despite their small size, are of enormous value to our ecosystem,” said Cathy Liss, President of the Animal Welfare Institute. The Endangered Species Coalition has also produced a slide show to accompany the report, featuring stunning photos of each of the ten species in the report. The Coalition produces a “Top 10” report annually, focusing on a different theme each year. Previous years’ reports are also available on the Coalition’s website. Ninety-five percent of the Sierra Nevada and Southern California mountain yellow-legged frog populations have gone extinct due to human degradation of their habitats. Lakes we’ve stocked with trout are devoid of tadpoles, and pesticide contamination causes mutations, sterility, and death. More than 1,800 species of frogs currently face extinction. Monarch butterflies are totally dependent on milkweed for survival, but the wide-spread use of pesticides is killing off milkweed across millions of acres of the monarch’s core summer habitat. Climate change and illegal logging in their Mexican winter refuge further imperils the monarch’s survival. The North Pacific right whale is the most endangered whale on Earth; there may be as few as thirty remaining in U.S. waters. Lack of genetic diversity and diminishing food sources due to climate change are major threats, but human activities—oil spills, ship strikes, and the Navy’s live sonar testing—may be sounding the death knell for this marine mammal. Only about 350 adult great white sharks remain off the coasts of California and Mexico. Hunting these sharks is illegal, but hundreds of young sharks are inadvertently caught in fishing nets and die each year. Great white sharks are the largest predatory fish and are important to maintaining balance in their ocean ecosystem. Little brown bats are in peril due to white-nose syndrome, an illness caused by a deadly fungus from Europe. These bats are virtually extinct in their core Northeast range, and up to 99 percent have died in affected areas. Weakened immune systems due to pesticide exposure and human disturbance in their caves are also factors in their demise. Contact: Katie Gilles, 512-327-9721, Bat Conservation International, kgillies@batcon.org; Amey Owen, Animal Welfare Institute, 301-706-1390, amey@awionline.org. Whitebark pine forests used to be plentiful high in the Rockies, but climate change has allowed beetle infestations and fungal disease to destroy these trees. More than 100 species depended on this pine for shelter and food, and the pine’s shading limbs regulated snow melt well into summer. The rusty patched bumblebee is a critical pollinator. Its “buzz pollination” produces tomatoes that are consistently larger and sweeter than those produced by other pollination techniques. The rusty patched bumblebee is threatened by diseases from commercial bumble bees. All bumblebees face threats from the use of neonicotinoid pesticides on plants that can even make their nectar and pollen toxic. The greater sage-grouse’s habitat once encompassed nearly 300 million acres, but their range has declined dramatically as humans have moved in to graze livestock and drill for oil and gas, without regard for sage-grouse habitat needs. Hundreds of miles of roads have fragmented sage-grouse populations, which are in peril due to aggressive degradation of their habitat. Polar bears are entirely dependent on ice for fishing, and a large adult requires an average of 4 to 5 pounds of seal blubber every day just to maintain its weight. But as climate change alters their habitat, they are being forced inland for denning, breeding, and feeding. Federal dams block the lower Snake River, making it almost impossible for these salmon to migrate to their spawning grounds high in the Rocky Mountains. These are the most endangered salmon in the world, but scientists agree that they can make a comeback if the river is unblocked so they can complete their life cycle by migrating to and from Redfish Lake. For more information please contact Derek Goldman, dgoldman@endangered.org (406) 721-3218 or Tara Thornton, tthornton@endangered.org (207) 268-2108. Please update this article with the best available science. New analysis indicates a minimum all-life stages great white shark population size of >2000 individuals in the California subpopulation. Humans are the most destructive, heartless and most ignorant dumbasses on the planet. The world and all its animals are doomed as long as humans continue to overpopulate and inhabit the globe. I AM SADDEN BY ALL OF THIS. BUT I’M ALSO A FIGHTER AND HAVE A LOT OF FAITH,I WILL KEEP FIGHTING FOR OUR ANIMALS , EXT. AND OUR DEAR PLANET EARTH. IF YOU CARE YOU WILL KEEP UP THE FIGHT.WE CAN END THIS BUT WE MUST NOT GIVE UP THE FIGHT.